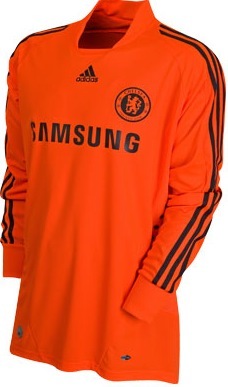 Chelsea stopper Petr Cech hit the headlines in the weeks before the 2008 European Cup Final, with his choice of a bright orange coloured goalkeeper shirt for Chelsea. 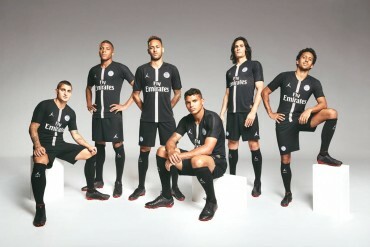 The shirt was supposedly developed by a Russian scientist, after painstaking research that discovered that the colour was particularly distracting and imposing for opposition players. Perhaps that’s why Holland, a nation of only around 16 million people, has always done so well at football. But then again, it didn’t help Chelsea win anything last season. Perhaps then we will have to wait to see Chelsea, and Cech’s, performances in the Premiership this season, but the craze might just take off. The logical corollary of the insanely-brightly coloured goalkeeping shirt, is the insanely brightly coloured goalkeeper glove; and with the new ‘Touch / Feel’ goalkeeper gloves, specialist goalkeeping brand Kaliaaer have produced exactly that. 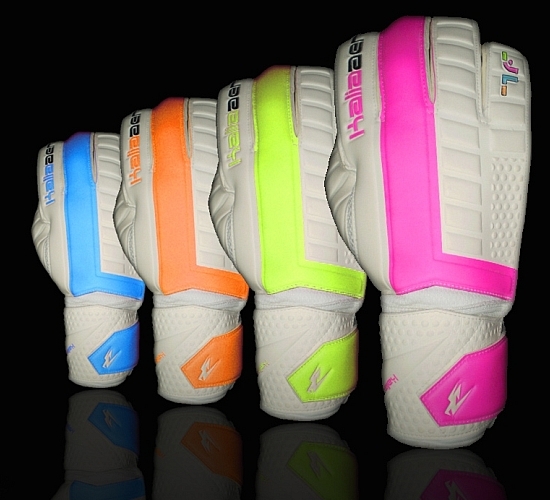 With the first release in what is to be a sequence of fluorescent goalkeeper glove designs in the Touch / Feel range, the pink and yellow Kaliaaer goalkeeper gloves come with the express job spec of making a glove that “not only looks unique, but also makes the hand seem larger and more distracting to oncoming players”. And distracting they certainly will be. It’s not impossible that goalkeepers may even employ new hand waving tactics in one-on-one situations in order to mesmerise oncoming strikers into tripping over their own feet. Well, perhaps that’s taking it too far, but you get the picture. One thing that Cech didn’t do with his orange jersey was to vary the colours. He probably felt that bright orange was enough. But the Kaliaaer Touch / Feel goalkeeper gloves are highly unusual in that each hand of the gloves is actually a different colour. The right hand features a traditional white body with fluorescent pink stripe and wrist bandage, with the left hand identical but in fluorescent yellow instead. This is one of the features that sets out the Kaliaaer T/F goalkeeper gloves as one of the most interesting goalkeeping equipment releases of the season. Importantly, the new Kaliaaer T/F goalkeeper gloves aren’t just about appearance. They are a very finely constructed model of goalkeeper gloves, well cut, incorporating a number of top technological features. The palm is constructed from Kaliaaer’s own ‘aerGrip’ foam, which received very strong reviews from senior goalkeepers in trials and pre-release. The gloves also feature SSG grooved latex foam on the inside of the palm, aiming to increase friction between the hands and the gloves, thereby reducing movement and slippage. One of our favourite features of the glove is the moulded “tyre track” backhand, which is a design feature contributing to the gloves’ unique appearance. For full details on the glove specification, see below. There’s no getting away from it, the Kaliaaer Touch / Feel gloves will fiercely divide opinion. For the shrinking violets among goalkeepers, the idea of stepping out onto the pitch in such bold and stark apparel may well be a bridge too far. Nevertheless, with goalkeepers, like Cech, more interested in technological development, innovation and – let’s be frank – just making a statement, the Kaliaaer Touch / Feel goalkeeper gloves will prove hugely popular. Next articleBILIC TO SUCCEED CURBS? Just ordered a pair of these off thegoalkeeperco.com, can’t wait for them to come in. They finally came in, and I’m thorougly impressed, I think i’m sticking with Kaliaaer from now on.